Barbados had a Contender? Yup, he was one Hell of a Pugilist! 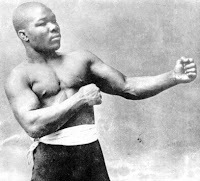 I was sailing through Google today when this one hit me (pun intended) – “…in 1904 Langford got his chance at welterweight champion Joe Walcott, the Barbados Demon. This was Langford‘s first and only title shot and with analysis of the reports it is clear he was done an injustice. Langford proved too illusive for his opponent and when drawn into a dogfight he also had initiative. ?The fight was ruled a draw but as reported by the ?National Police Gazette? ?there were plenty present who thought Langford won?. Langford dominated the first seven rounds and remained untouchable with his calculated style and by the latter stages of the bout Walcott’s desperation left flaws in his roughhouse approach, which Langford willingly exposed.? What exactly constitutes a diminutive stature? Most records indicate at least 5’1″ and little much past that, however, it was his physique and his reach that created the Goliath in this David! Records from the early 20th century are a bit iffy, some say the Barbados Demon was born 1873, while others indicate 1872 – there are claims he was born of Bajan parents in Demerara in then British Guiana? Others say it was here in Bim, but not what parish. The new of the mam who located Walcott was Wilfred Cereghin and he went by Will and he was my paternal grandfather. Really hoping you can correct the info. Previous: « Doesn’t Fontabelle look lovely? Not!